Prospective assessments can be a reliable way of capturing the full burden of disease from an unselected population shortly after diagnosis of AF. GARFIELD-AF has reported 2-year incidence rates of adverse outcomes in patients newly diagnosed with AF. Rates for major outcomes were highest during the first 4 months (figure). 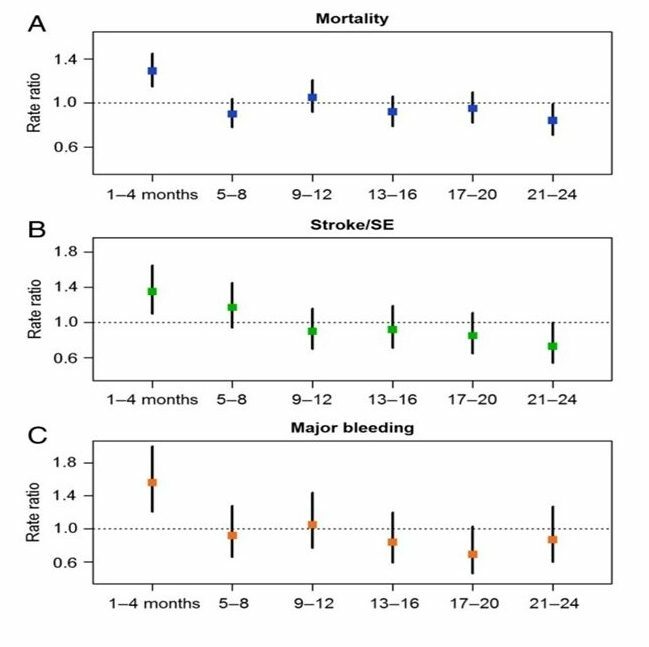 Four-monthly rate ratios for all-cause mortality (A), stroke/systemic embolism (B), and major bleeding (C). What is shown is the ratio between the observed number of events in the period and the expected number of events obtained by applying the overall rate to the period. Only the first occurrence of each event was taken into account.